Description: Superficially, SCP-1903 looks to be an average north country town of ██████, ████████. The town covers an area of just 25km2 and is prone to arbitrary snowstorms and thick fog. Upon closer inspection, SCP-1903 seems to encompass architecturally-styled buildings of the 1950’s and 60’s;moreover, it holds working electrical utilities, running water, and even a radio station with mostly holiday and love songs of this era. The town was believed to once be a solitary mining town; a mine was discovered, and sought by some as a refuge from the storm, those who did, are believed to be among the first to disappear. 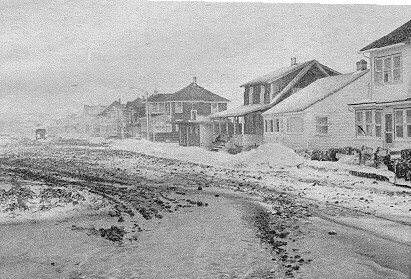 The original population of the small town is yet to be determined; and although no populace is present, the snow can be seen clad with varied footprints, and objects tend to be moved from their last position: as if put to use in their time unobserved. A presence in the town, hereafter referred to as SCP-1903-1, appears to cause persons left alone to vanish and experience variations of the town and their own psyche. These variations can be dramatic, and seem to build anxiety and turmoil within those subjected to them. Journal reports seem to indicate that days grow shorter over time; however, no such postulate has been proven: the sun seems to rise and set as normal. Research has led to some disappearances, reappearances, and even re-disappearances. Those who managed to vanish twice, are believed to have been [DATA EXPUNGED]. SCP-1903-1 seems to be the cause of the frigid temperatures, the erratic weather and the “psychic-arrangement” of the town. Class-D personnel recovered from the town recall these features' prominence increasing while pursued by 1903-1. However, they have only been able to describe their pursuer in vague terms; “the darkness,” and similar. The town seems to hunger for energy: be it heat, light, etc…within its phenomenon’s range to absorb it. This assumption is based on no reports of SCP-1903-1 outside during the day—as all equipment during research was operational at this time, and slowly, was rendered useless as night approached. The range of the Phenomenon of SCP-1903-1 seems to have expanded since the guard incidents; furthermore, it would seem, the incidents in question prove to extend the psychic integration of the town to those who observe it. (See Addendum-1903-F for Guard Incident Report.) Much is not known: the times of vanishings seem to have no correlation to one-another, however, at this time no further testing is permitted. Dr. █████ ████████-03, accompanied by controlled Class-D personnel, assigned to map and document the town during the day have been [DATA Expunged]. The Class-D's under Dr. █████ ████████-03's control, were to serve as both hands to gather information and subjects to gather experimental data. The disappearances were unexpected, yet unambiguously prepared for. 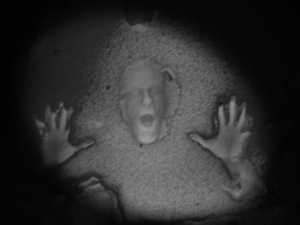 From their survivors, information on the phenomenon of SCP-1903, the town, or rather SCP-1903-1, the cause of the phenomenon, has been excavated. During the day, 4 of the ██ subjects exposed to the town wandered off; the subjects who wondered, have not been found. The subjects salvaged at 7:23, before sundown, all testified that they had not seen each other since the first minute of their arrival; leading to the conclusion, that each had wandered off to their own accord. Once separated, and not in sight of others by cover of snow or fog, each of their stories derail from any connection. Testimonies by subjects importuned ears to listen to their erratic, and frankly unnecessary rantings, on how the town thins the ranks of groups, by enticing individuals to wander. Each subject gave an excuse for breaking from the group similar to a personal call; such as, the call of a loved one seeking refuge from the storm. Curiously, such memories of D-class personnel should be erased. The subjects all insisted on the presence of a populace within the town, yet with names and varying descriptions never overlapping. One can conclude that a distortion between the subjects perception of the town and its reality is present. All survivors returned before sundown, and had been carrying objects taken from the town between the midday-disappearances and their before-sundown arrival. Although those originally to have wandered remain unaccounted for, it seems as though the surviving subjects from this event have all recently gone missing, an hour since they were interviewed. Moreover, it seems as though the objects recovered from the town, by the survivors, have too, gone missing. Additionally, footprints leading from their temporary storage back towards the town have been noticed, and once traced to the town, in mid track, they end. Objects on person of the subjects recovered from the town included: 4 journals, 6 photographs, 2 flashlights; and 2 gas pocket-lighters, a box of matches, a camera, and a can of frozen sardines. The journals belonged to four people, three male, one female and all between the ages of 30 and 40; two of which, were previously reported as missing persons. The dates since-missing range as early as the mid 1960's to the early 1970's, and one with the dates removed. The journals all seemed to have contained a list of supplies; which mostly, are composed of heat and light sources. They each recounted many personal details, said to be “sewn” into the town’s world. The memories always seemed to keep their subjects on the move, and often had them philosophizing, sporadically, on nihilism and solipsism. They also contained similar phrases seeming to be survival tips, “Electrical lighting works, the void smirks.” Each gave accounts of being pursued by an entity we call SCP-1903-1; which, pursued the authors wherever they hid during the night, and absorbed all traces of energy they left behind. Heat and light within the refuges the writers warmed and defrosted with firelight, were claimed to be snuffed out by this entity. Water that they returned to liquid state froze, and electrical technology salvaged by them for use, such as the still-working light fixtures of their temporary stakeouts, flickered during approach of 1903-1, and ceased on its arrival. Further study of the journals testify that SCP-1903-1 is the cause of the erratic weather, the cold air, the withered vegetation; and possibly, the taunting memories. Professedly, as 1903-1 draws nearer memories shaping the world become more vivid and heat and light sources are enveloped and snuffed out; living entities shrouded by darkness in its wake, apparently, freeze and flicker from sight forever. The Following image could be the pursuer, or perhaps, the pursued? Journal-3 was found with the Camera—both had fallen angled from a desk; and with that camera, photos, and a pair of eroded footprints planted in the snow, just a reaching-length from the desk. I’ve been put in charge of an important project, but rather than joyfulness being common-most in my mind, I feel to be no more than a figure head. Euclid containment protocol is preventing my research on a stationary subject; containment, would of course imply a chance that the subject might take leave, stationary, would recommend that such an outcome is inconceivable. No less…I am at the whim of mere protocol, whilst breakthroughs could be made! Three more mornings it will be, before my Level 3 clearance warrants research into what is still being vacantly named a research site. Nothing interesting can come of patience, for studying that which never moves…nothing at all. Although, perhaps, it is just the anticipation, but I feel as though the material for research is reaching me from beyond the perimeter, which lies between me and the town. Earlier today, I was observing the town, in a dream, and during my light afternoon nap, I had gotten more research completed, sleeping on it, than in all the time we’ve wasted here! Though, in all seriousness, my research was mere observation; it was as though the town could falsify your memories. I had seen a person in the fog, regrettably, one I had once remembered every day—and now, one I’d rather soon forget. It’s as though the town wants me to face my fears…an interesting notion, but still…I’d rather get into more tangible research than mere daydreaming….A final remark on that last word, “daydreaming,” although my mind is as sharp as ever, an uneasy daze came upon me when I had awoke to find myself not in my office—in bed, but on the observation deck this afternoon. Time is unkind, as life is to the meek: age makes all meek, in time. I assumed that this position would finally be one of adventure! I've waited long enough. It seems, that the unknown is all the human being must live for; something better; something greater.So, it is a matter of pride one must attest to, in rectifying irreconcilable failures under unnecessary, stagnating protocols. Permission will be granted, no, decreed—that tomorrow, a successful operation will take place, without such strict limitations on progress. SCP-1903, is to be tested and mapped, under organic operations following the dismal attempts with unreliable technology. I am ordering a number of Class-D's and making a name for myself…. - Dr. █████ ████████-03, final words. An established 500m perimeter around Research Site 1903 is to be maintained at all times. The site is to be monitored and researched by those of Level 3 clearance under strict protocol of non-invasive study; or that of adhering to inorganic contact with SCP-1903. Standard procedures for Euclid class containment apply as necessary; precaution is due to breach of protocol proving imminently fatal. Guards are to be stationed on each wall of perimeter for observation and proof of clearance. At 3:33 AM the four guards on duty at Research Site 1903 were relieved of duty within minutes of each other and temporarily replaced on the grounds to survey suspicious behavior in Site 1903-A, B, C, and D, respectively. At 3:41 AM the on-duty temps relayed the previous notion of suspicious behavior in their respective sites, and upheld the previous actions to be taken, at 3:44 AM action was granted. The guard’s reports revealed that there were four sets of footprints they followed to the town; however, it seems only three sets of footprints led to the town with one leading away. One guard had neglected to hand in a report; the guard was confronted at 4:03 AM following the search and had apparently been off duty just prior to the search by the former guard. This guard had neglected his paperwork, and seemed to be playing hooky, the temps who held the search were questioned about their fourth member, but insisted that they had only taken three. At 4:32 AM the formers and their temps were replaced by full duty guards in light of their respective disappearances at 3:41 and 4:24 AM. The footprints leading from the town lead the temps to [REDACTED]. - It would seem we have taken too many chances with this town, in light of recent events, containment is priority. The Phenomenon of SCP-1903-1 requires only the attention of your senses;furthermore, it seems as though the cold snap plaguing the town is growing in radius with each claimed in the storm.